Only not-for-profit personnal use is authorized for any hardcopy printouts of this page. Information content presented here is the intellectual property of Mr. Robert Roehrig and The James Millen Society is not responsibility for accuracy of content. Most any vintage receiver that is used for CW/SSB and the digital modes can be improved with the addition of a product detector. This provides undistorted audio without detector overload. The product detector keeps the BFO signal out of the AGC detector so the AGC can be left operative and a side benefit is that the S meter will function as it should. 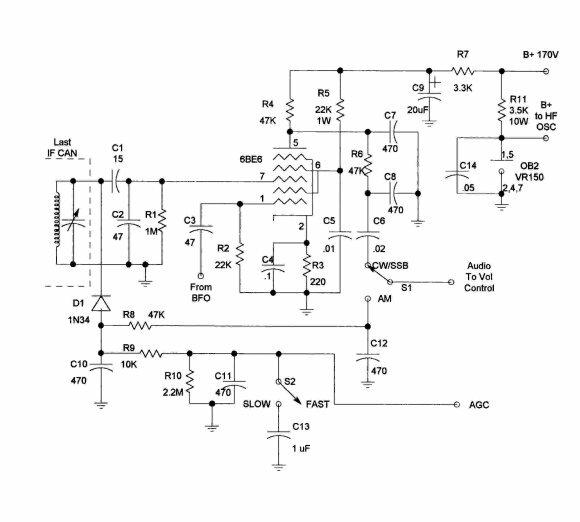 The RF gain can still be reduced manually if desired although it is seldom necessary. In the case of the HRO "senior" receivers, minimal mods are done to the receiver itself, making restoration to the original circuit easily possible at a later time if so desired. In addition to adding the product detector, I also added voltage regulation to the HF oscillator stage. The BFO itself is pretty immune to voltage variations so it was left as is. For the product detector, I used a 6BE6 which is socket mounted on a L bracket under the chassis. The OB2 is similarly mounted. Only the secondary leads of the last IF-can need to be reconnected and the BFO ON/OFF switch is rewired to select the appropriate detector output being fed to the volume control. I recommend using miniature coaxial cable, such as RG-174, for the connections to S1 to avoid hum problems. If you are fortunate enough to obtain one of the Vector 7 pin sockets for the 6BE6, the components can be mounted directly on that socket assembly, otherwise you can use terminal strips or a small PC board. The AM/AGC detector circuit should be mounted on a separate terminal strip or PC board mounted close to the IF-can. After installation, the BFO is checked to determine if the frequency needs to be readjusted, and the last IF-can should be realigned. S2 is the original meter ON/OFF switch. When in the AM mode, the AGC should be switched to the FAST position. If desired, a 6SA7 can be used in place of the 6BE6 using the same component values. I have successfully used this same circuit in several other receivers types including a Hammarlund SP-600, a Hallicrafters SX-28A, and a surplus BC-348-Q. Critical to adapting this circuit to other receivers is the IF signal level. If overload occurs, you must increase the value of C2, which acts as a voltage divider with C1. The BFO injection level does not seem to be quite so critical and I have had no problems there.